Regarded by the Romans as “fatale monstrum”- a fatal omen, Cleopatra is one of the ancient world’s most popular, though elusive figures. The Egyptian Queen has been immortalized by numerous writers and film-makers, most popularly by Shakespeare in Antony and Cleopatra, and by Hollywood in Cleopatra (1963) starring Elizabeth Taylor and Richard Burton. The latter work features the memorable image of the enticing young Cleopatra emerging gracefully from an unfurled carpet in front of Roman general Julius Caesar. But is Cleopatra to be regarded merely as the lover of Julius Caesar and Mark Antony? Or did she play an important role not only in the history of Egypt, but also in that of the mighty Roman Republic? 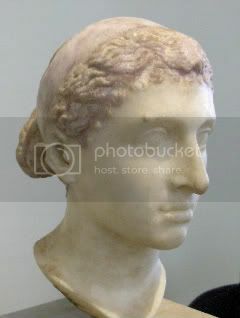 Cleopatra VII Philopator (‘father-loving’) was born in January 69 BC in the city of Alexandria, Egypt, the daughter of Ptolemy XII Auletes (117 BC –51 BC) and possibly Cleopatra V Tryphaena (c 95 BC – c 57 BC). Cleopatra was to become the last monarch of the Ptolemaic Empire (established in 323 BC after the death of Alexander the Great), ruling Egypt from 51 BC to 30 BC. In 48 BC Cleopatra had become an ally and lover of Julius Caesar and remained so until his assassination in Rome in March of 44 BC. The death of Caesar threw Rome into turmoil, with various factions competing for control, the most important of these being the armies of Mark Antony (83 BC– 30 BC) and Octavian (63 BC – AD 14), the former a supporter and loyal friend Caesar, the latter his adopted son. In 41 BC Cleopatra was summoned to Tarsus (in modern southern Turkey) by Mark Antony. She is said to have entered the city by sailing up the Cydnus River in a decorated barge with purple sails, while dressed in the robes of the Greek goddess Aphrodite. Antony, who equated himself with the god Dionysus, the Greek god of wine, was instantly won over. Much like the meeting between Cleopatra and Caesar, both sides saw something in the other which they needed. For Cleopatra it was another opportunity to achieve power both in Egypt and in Rome, for Anthony the support of Rome’s largest and wealthiest client states in his campaign against the might of the Parthians (Parthia was a region in modern north-eastern Iran) was highly desirable. At the meeting Cleopatra allegedly requested that her half-sister Arsinoë, living in protection at the Temple of Artemis at Ephesus, be executed to prevent any future attempts on her throne. Anthony and Cleopatra soon became allies and lovers and he returned with her to Alexandria in 40 BC. In Alexandria Cleopatra and Antony formed a society of “inimitable livers”, which some historians have interpreted as an excuse to lead a life of debauchery, though it was more likely to have been a group dedicated to the cult of the mystical god Dionysus. In that year Cleopatra bore Antony the twins Alexander Helios (the Sun) and Cleopatra Selene (the Moon). The political situation in Rome compelled Antony to return to Italy where he was forced to conclude a temporary settlement with Octavian, part of which was that he married Octavian’s sister, Octavia. It was to be three years before he and Cleopatra were to meet again, at the city of Antioch (near the modern Turkey / Syria border) under the shadow of the Octavian’s growing military power in the West. One result of this meeting was that Cleopatra became pregnant with her third child by Antony (the future Ptolemy Philadelphus); another was that parts of Rome’s eastern possessions came under Cleopatra’s control. In 34 BC, despite the fact that Antony’s Parthian campaign had been an extravagant failure, Antony and Cleopatra celebrated a mock Roman Triumph in the streets of Alexandria. Crowds flocked to the Gymnasium to see the couple seated on golden thrones surrounded by their children, and Antony made a proclamation known today as the ‘Donations of Alexandria’. In this declaration Antony distributed lands held by Rome and Parthia amongst Cleopatra and their children, and proclaimed Caesarion as Caesar’s legitimate son. Powered by WordPress v 4.9.10. Page in 0.330 seconds.